A pistol grip designed for the M4/M16/AR-15 series rifles with features previously unavailable in a combat-quality grip. 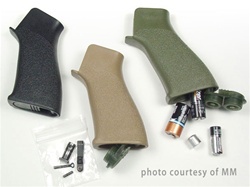 Along with superior ergonomic form that provides substantial shooter comfort over any other grip, BATTLEGRIP has the ability to internally store two Aimpoint-type batteries in addition to two AA or 123 series Lithium batteries all in a water, dust, and rattle-resistant cavity sealed by an easy-to-access cover. The batteries contained inside of the BATTLEGRIP's indestructible Nylon/glass-fill housing are for immediate use and can be removed in a second for installation in night vision, IR, visible LASER aimers, high-intensity white light, and Aimpoint/Eotech-type LED sights. Other battery storage combinations can be achieved using supplied spacers. Model BG-16 fits all M4 / M16 / AR-15 series rifles and clones, Armalite AR-10 and Knights Armament Corp SR-25 / MK -11 Mod O.